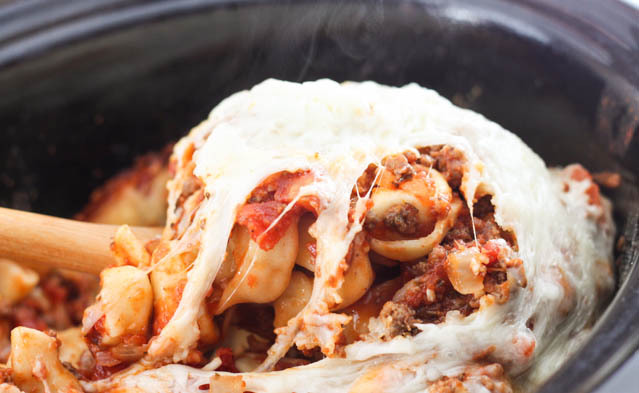 This Cheesy Crock Pot Tortellini Casserole recipe is quick and easy to make and kid approved! If you ask my oldest (5) what he wants to eat he will 90% of the time yell “PASTA,” (the other 5% of the time he picks steak). 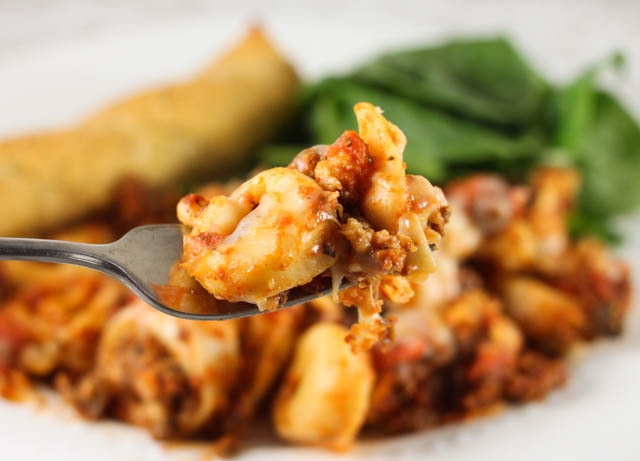 This Slow Cooker Cheesy Ravioli Casserole has been a favorite of ours so I decided to make it with Tortellini and now I can’t decide which one if my favorite! You could almost call this tortellini lasagna because you layer the pasta and sauce, except it is missing ricotta. Lasagna isn’t lasagna without ricotta, in my opinion! 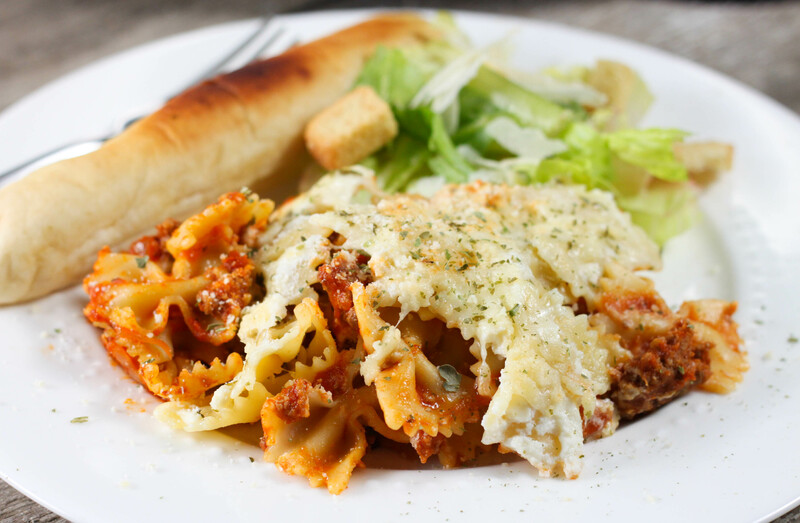 Here is my recipe for Crock Pot Lasagna Casserole. I love to make my pasta sauce with both sausage and hamburger. 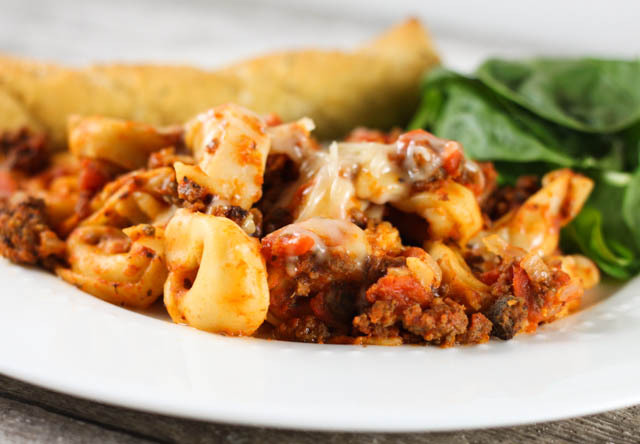 I love the flavor the combination has so I often double the sauce portion using a pound of both and freezer the other half for a quick weekday meal. Different size and brand crock pots cook different so the first time you make this recipe (or any recipe) watch to make sure you don’t over cook it. This is one of those recipes I would use a crock pot liner on. Melted cheese isn’t any fun to clean up in a crock pot! I do not cook the tortellini before hand. 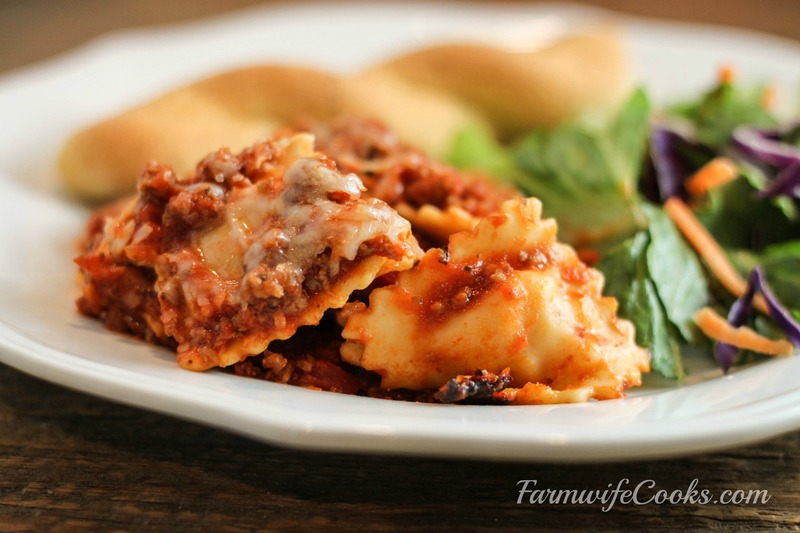 We prefer cheese tortellini and meat sauce but you can use whatever your family likes best. Serve with a side salad and garlic bread (or twist bread sticks, the favorite at our house) and dinner is served! Brown the hamburger over medium heat in a medium size skillet..
Add the onion, garlic and tomatoes and simmer for 5 minutes. Add the spaghetti sauce, Italian seasoning, salt and pepper and let simmer another 5 minutes. Place 1 cup of sauce on the bottom of 5 to 6 qt. slow cooker. Add half of the frozen tortellini, half the remainder of sauce and then repeat. Cook on low 4 hours or until tortellini is tender. 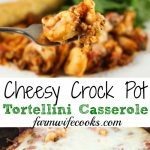 Tortellini recipes in the crockpot are so easy and delicious! I love this twist on classic flavors!